Announcing the end to all traffic snarls in Long Beach. OK, that’s mighty wishful thinking. But those snarls can be minimized with effective traffic control in Long Beach. Roadway Construction Service has been doing that for years. Backed by expertise and experience, we’ve kept things well under control in many road construction zones. But don’t think we’re limited to those sites. We also handle public events, like spectacular Fourth of July parades. Lots to keep track of. But we do. And we do it wherever Long Beach requires high-level road traffic control. 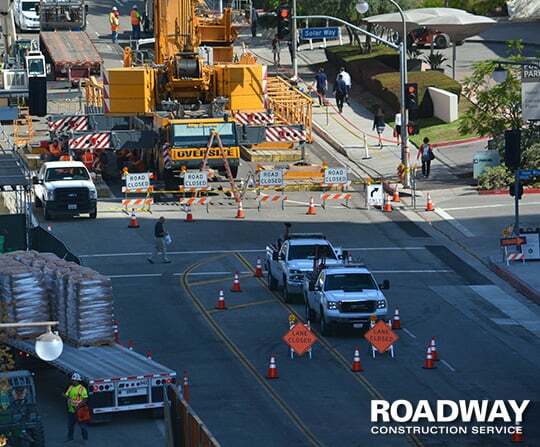 Maintaining effective traffic control in Long Beach is not as easy as it looks. We know you’ve seen the barricades, the walls, the cones, and those serious-looking folks waving brightly-colored flags. How hard is it to move a flag back and forth? Well, here’s the real story. Everything we provide to a serviced site requires intensive traffic control planning. The kind that takes expertise, insights, intuition, experience, and many, many hours. Our traffic control planners, or traffic engineers, stand at the top of their field. Nothing less will do when you’re covering so many important details — weather, traffic density, pedestrians, crews, possible hazards, and more. But they always get what they’re after – a rock solid traffic control plan. Which makes the effort more than worth it. Expertise and experience also play important roles when securing traffic control permits. No work begins without these authorizations No permit, no traffic control. Period. This means plans must be right on the money to satisfy local decision makers. Not exactly a walk in the park. But thanks to diligence and knowledge, we consistently get it right. The result is timely approvals without the risk of costly delays. Resource deployment is a part of every plan. Hardware is one of those resources. Every road traffic barricade, from Jersey wall to cone, must fit into a comprehensive strategy. Solutions such as lane closures seldom work out well unless we know which barricades go where — well in advance. Spontaneity is not part of our program, planned traffic barricade rental is. The same holds true for the deployment of traffic control flaggers and other personnel. Number of onsite crew members, their arrangement, and their objectives all must be worked out well ahead of time. Of course, it helps to have such eminently qualified personnel in your corner. Take our flaggers, for instance. These expert communicators maintain smooth, safe traffic flow without fail. But their expertise didn’t develop overnight. Each of our flaggers is thoroughly trained and qualified by certifications such as OSHA. And they keep on getting qualified through ongoing training and education. You just can’t stop improving when you’re on our team. Would you like to learn more about premier traffic control in Long Beach? Reach out to Roadway Construction Service any time. We’ll be happy to provide additional information and answers to all your questions.